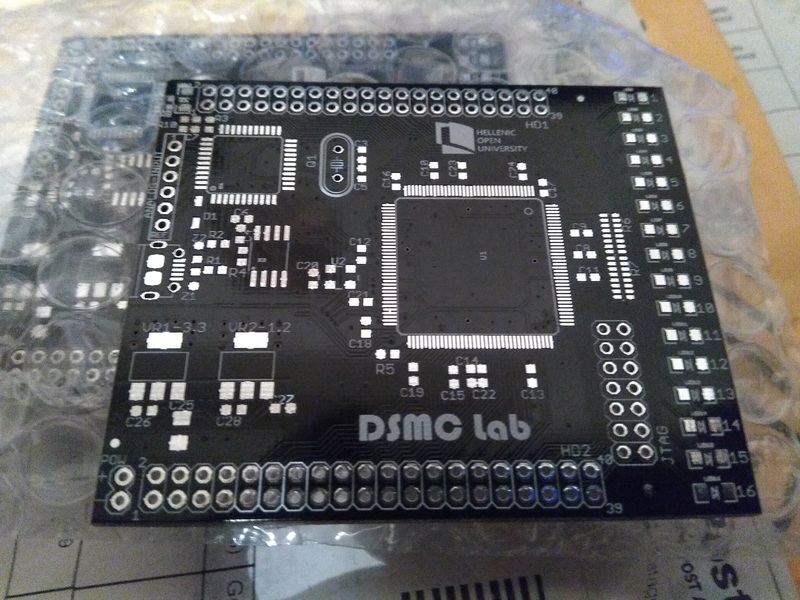 DSMC delivered and tested the 1st version of its prototyping and educational platform based on the Xilinx + ATmega32U4 development platform. The prototyping and educational platform is designed to facilitate students’ hands-on practice on digital system design, FPGA design, microcontroller programming and embedded system design and it is tailored to the requirements of distance learning. The platform hardware design, assembly and software development was completed in-house by Anastasios Fanariotis, DSMC research associate and HOU MSc student as part of his MSc project. The platform is based on an in-house design of a two-layer development board with both on-board resources and breakout connector facilities to allow easy experimentation and execution of both educational as well as research projects. The development board is designed with special focus on lowering the overall production cost. 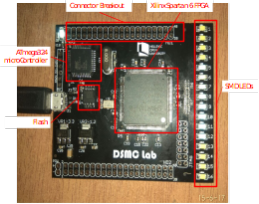 It is equipped with a XILINX ® Spartan VI SLX9 QFP-144 FPGA and an ATmega 32U4 microcontroller that features a dual function able to serve both as a PC bridge for FPGA program downloading via a USB connection, as well as a target processor for embedded program development. 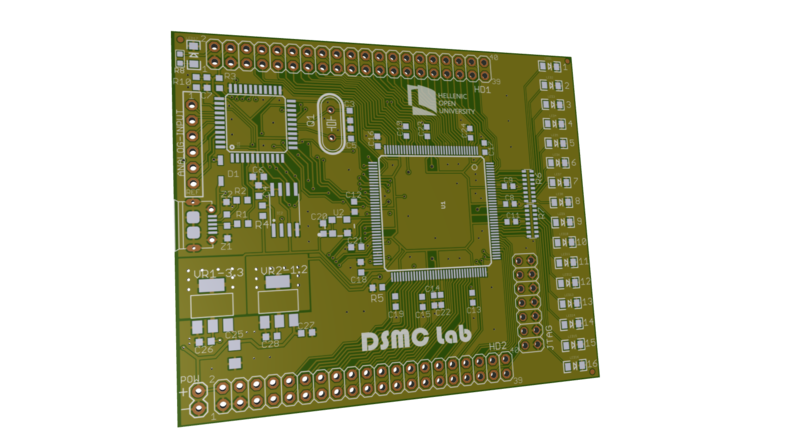 The board also holds Flash EEPROM for permanent FPGA programming, on-chip crystals, power circuit and 16 LEDs connected to FPGS I/Os as well as 2×40-pin breakout connectors providing access to FPGA I/O pins for system design and experimentation. The board is Arduino pin compatible so that in future versions the Arduino IDE can be used for microcontroller programing. 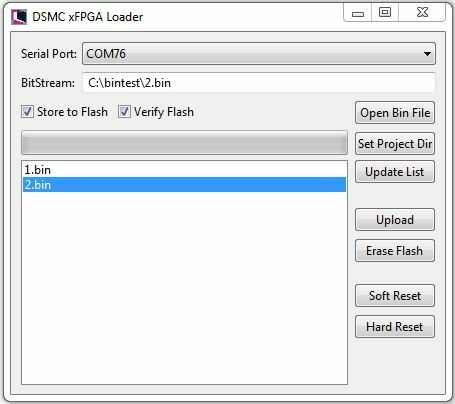 To avoid the unnecessary cost of specialized FPGA programmers a customized version based on the open-source distribution of the Mojo Loader has been developed enabling full software control and programming of the on-board FPGA. 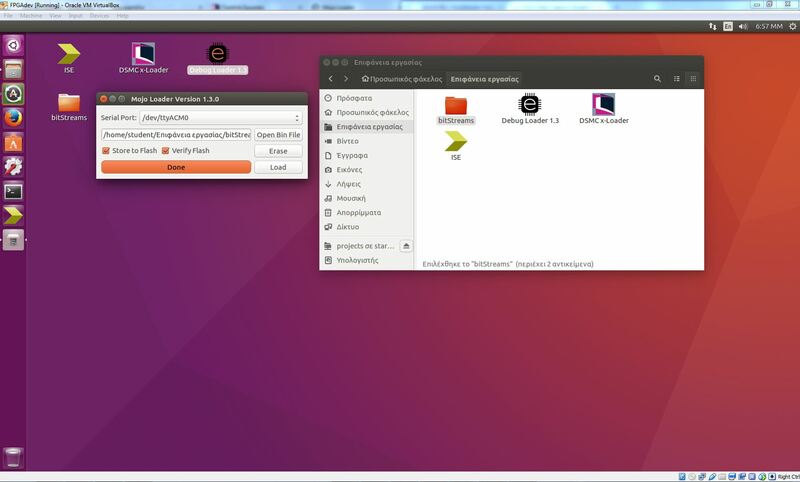 The educational SW platform is packaged in a VM including all the required tools comprising of Xilinx ISE, DSMC FPGA loader and sample projects. Thus, a standardized educational platform is made available that can be shipped anywhere to students that are enrolled to distance leraning engineering courses and complete digital and embedded design courses with online tutoring.